Something as small as a seed can have a worldwide impact. Did you know there are top-secret seed vaults hidden throughout the world? And once a seed disappears, that’s it—it’s gone forever? 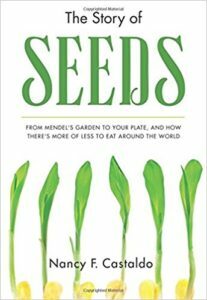 With a global cast of men and women, scientists and laypeople, and photographic documentation, Nancy Castaldo chronicles where our food comes from, and more importantly, where it is going as she digs deeper into the importance of seeds in our world. This empowering book also calls young adult readers to action with suggestions as to how they can preserve the variety of one of our most valuable food sources through simple everyday actions.